To speak briefly, we play Black Metal. Nowadays this style is like a tree with a lot of branches - divided in many sub-styles. Depressive black metal, raw black metal, symphonic black metal, viking black metal and so on indefinitely, so far as one’s fevered mind can imagine. In any case all this is black. And this isn’t just music; it is particular atmosphere and ideology. We didn’t feel shy of introducing in dark basis of our music new elements. So, at our split "Sun wind/Four seasons” we tried our forces in slower, more atmospheric metal with D/S/B/M/ elements. While collaborating with Yansen we tried fully acoustic sound. That’s why our listeners ambiguously perceive a lot of our works. It’s impossible to please everyone, and we never aimed at it. We just do what we think is necessary – to appreciate and criticize is for listener. We just do Black Metal. How do you call this is not our part. What about particular bands… Ulver, Impaled Nazarene, Watain, Dark Funeral, Anaal Nathrakh and many, many more bands, which influenced a lot at our members’ outlook, could be endlessly listed. Concerning Gmork material – we try to go our own way, looking at nobody. In this world no person should do anything for another. A man, interested in Gmork work, can download music from Internet. Now is such a time, and we are not against progress. After all, this opportunity increased amount of potencial listeners and make our music more available. On the other side, the quality in mp3 format is quite poor. Add to this we are very carefully to our releases’ design and to listen CD at home, leaf over jumbo booklet gives more pleasure, than boringly at the double click on browser’s buttons. We live in time of high speed, but lazy asses. We will give an example. Of cause, you may not visit theatres and look TV-translations of plays instead, sitting on the sofa and sipping beer with chips. Yes, you will have a certain idea about theatre plays, but degree of esthetic pleasure will be incommensurable. Speaking about media, we recall a funny case, when in 2006 representatives of local MTV appeared on the gig with our participation and started to interview our drummer of that time. After several questions they said, they know practically nothing about metal and ask "just to scream something in the camera”. This suggests again that we are part of underground and stay strange for majority. And this in a whole fully suits us. So, reviews on our works appear in thematic webzines and magazines (as DarkCity, Rockcor, and Requiem). From very beginning concert work played a great role for Gmork. Performance of Black Metal band is not just a show. It is a ritual, which allows touching what we believe in and what we try to bring to this world. Only after visiting our live performance, you can in full feel all energy we put in our music and sense how greatly band believes in what it creates. 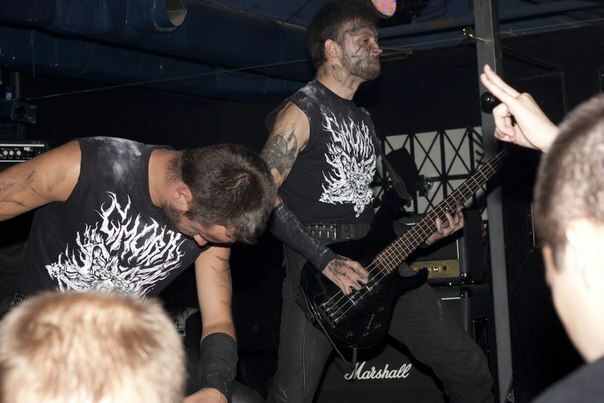 During band existence, we performed near hundred times in different Russian cities, including times we share the scene with Marduk, Ragnarok, Pantheon I, Morbosidad, Withershin, Sadist and many other bands. Music market is oversaturated. There’s no sense in trying to surprise somebody with new mixes of metal and some other genres. Everybody heard everything, everybody saw everything. But new music is coming against all the odds. During all the years of band existence we do not confine ourselves with any limits or stereotypes, but do everything in the way we consider as suitable. And we split on trends, fashion and "genre limits”, that changes every season because of consumers’ whim. But we’re always open to communicate with adequate people. Though we released new LP not long ago, but by this time our priority is to record a new material, over that we were hardly working from December, 2012, to May, 2013. It was already presented on latest Gmork’s concerts. Having no name yet album will include 7 absolutely new songs, and also Intro and Outro. At the moment we are hardly working on the studio, drum parts are recorded by now. We also planned a tour for support of «Death Spells Erotica”.